Adjusting the acceleration of your computer’s mouse is not a tough thing. You can just tweak the pointer acceleration settings in the control panel to adjust the mouse movements. It’s same for the laptop users as well, but they are set to work for laptop’s trackpad or touchpad. Imagine if you are attaching a mouse to the laptop, then you see the pointer behaving bit odd and that’s quite obvious because your pointer acceleration was set to work well with laptop’s touchpad or trackpad. I know you will be moving into the control panel again to change the settings! Uff…again! If you are using a Mac running OS X Lion 10.2 or above, then you are at luck. Today we are going to speak about an application called “Smooth Cursor”, which stays on a status bar and provides separate controls for customizing the mouse and trackpad accelerations. It means, you can have a separate settings for the trackpad or touchpad and an another one for the mouse. Smooth cursor can be handy, when you are using drawing applications or while playing a video game. 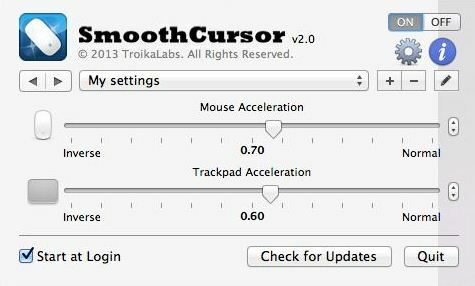 Smooth Cursor lets you to control the acceleration speed from 1 to 6, decelerate the speed from -1 to -6 and set zero to disable it. It’s quite easy to enable or disable custom settings via the app’s menu in the status bar. 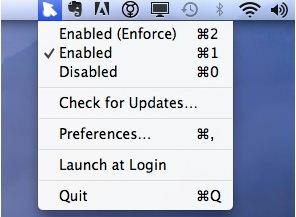 Interestingly, you can use enforce mode to ensure other application doesn’t modify the settings. The app will display system notification every time a different profile is activated using Growl or Loin’s notification center. However the feature is optional. The version 2.0 of the app comes with a special hot key mode; which lets you to alternate between profiles. Checkout Smooth Cursor and let us know how it worked for you?